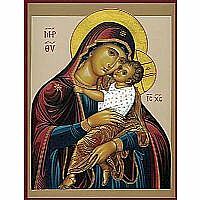 MCA019 4" X 6" ICON MATTED TO 8" X 10"
MCA119 6" X 10" ICON MATTED TO 11" X 14"
To the traditional iconographic image of Christ the Benefactor Br. Claude Lane, O.S.B. 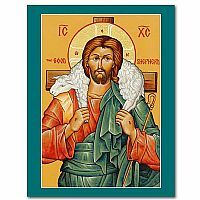 has added Biblical imagery of the Good Shepherd, drawn from St. John’s Gospel, chapter 10, and the 23rd Psalm. Jesus' hands show the wounds of the cross because the good shepherd lays down His life for His sheep (John 10:11). He holds a staff, or crosier, to indicate that He is the guardian of His flock. Many of us go through life feeling lost or without purpose, but this image helps us contemplate the Divine Compassion of God, “the guardian of our souls" (1 Peter 2:25). 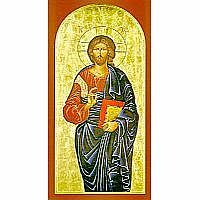 Christ the Benefactor is a classic motif in iconography, and depicts a sympathetic Redeemer, rather than the more stern �Lord of All� found in similar Pantocrator images. 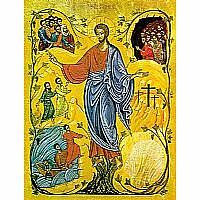 In these icons Christ is shown with a hand raised in blessing. The two extended and lowered fingers denote the dual natures of Christ. 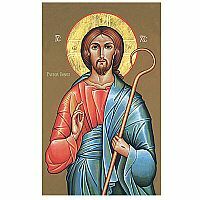 Jesus� red and blue clothing represent His �humanity cloaked in divinity.� The rather elongated face, thin nose and relatively large eyes create a mystical appearance that draws one in to the Holy Face. The circular strands of hair represent the endless flow of time. Christ's halo, the iconographic symbol for sanctity, is inscribed with a cross (the nimbus) and the Greek letters omicron, omega, nu, spelling "HO ON." In English, this becomes "The Existing One," the second half of the name used for God in Exodus 3:14 which is traditionally translated from Hebrew to English as "I Am Who Am." 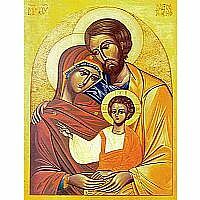 The abbreviated Greek form of the name Jesus Christ, "IC XC,� appears around the head of Our Lord. The face is the �true icon� and thus the name appears there. Sometimes in life, we may feel lost or without purpose. 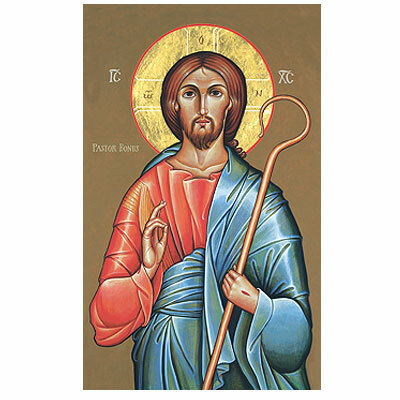 This icon serves as a reminder that we are always looked after with a shepherd�s care. Christ knows His own sheep and lays down his life for them. In contemplating this holy image, God�s Divine Will and infinite compassion draw us closer to the Pastor Bonus who left the ninety-nine sheep to go after the one that was lost (see Luke 15:4).